A new priest comes to a Brazilian coastal town and builds an insane asylum. Eventually the whole population ends up in the asylum. Graciliano Ramos' period he spent in prison after being considered a subversive element by the government. Despite being promised to another man, a young orphaned woman falls in love with man working at the farm she lives in , and together they escape. According tradition in Northeast Brazil, her aunt goes after them, in order to kill them for revenge. A star medical examiner is called to Brasília, the administrative capital of Brazil, to confirm the identity of a beautiful, young congressional aide's dead body. But his scientific rigor soon leads him to details of a multi-layered political scandal. From the series embarrassing ourselves in Cannes again. 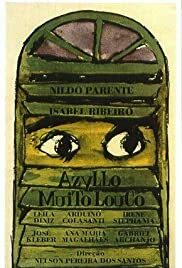 Brought on by the same director who provided the equally frustrating and awful "O Amuleto De Ogum", Mr. Nelson Pereira dos Santos creates in "Azyllo Muito Louco" ("A Crazier Asylum") one of the most excruciating films of all time, with no redeeming qualities whatsoever. This free adaptation of Machado De Assis work "O Alienista" (the book is regarded as a classic but it's one of his few I couldn't even finish, or maybe I did and don't remember) is a mess from the very first minutes but as a hopeless viewer who believes in a film all the way towards its conclusion I sat through it all and it didn't get better. It's no use to call it a junk or trash or ridiculous. It's pointless using those words. But trust me, it's terrible. Well I wonder...If the idea was to tell us that people of authority in Brazil were corrupt, perverted and crazier than the average respectable citizen but they're the ones in charge, so basically they can do whatever they want, I respect that idea and I believe in it. This is truly what's this all about. True then during the final days of monarchy and it's even more true now during our current political crisis revolving impeachments, new governments and absurd laws which doesn't favor the majority. If that's the idea...which means the deeper message, the whole background is marvelous, specially if we consider this was done during the military regime and the people in charge of the nation failed to see it, with no censorship at all and went sent this film to Cannes, a more intellectual audience who knew exactly the excrement that was going on in here. However, the foreground of such idea is terribly, miserably and awfully executed; it doesn't conquer viewers, it arranges detractors. This is first class torture, being the soundtrack the most stupid and painful experience I've ever heard. Santos uses scary noises in between dialogues, music scratches from scene to scene, dragging on and on at times while trying to create a suspense effect, and the film fails to decide if it's a drama, a comedy or pure satire. It fails on all accounts. The priest is deranged from the get-go, abuses of power though he firmly believes he's curing people and saving them from worst destinies. Problem is: he's not doing any of that, he can't do anything like it because his views on mental issues, insanity or whatever, is too narrow minded. In one scene, he simply explains that one factor alone contributes for a person to be committed to an institution, something like without morals, ethic or similar and the person is simply crazy. If the line between sane and insane is that thin, well boy, we're in deep trouble. And who gets to constitute such laws? A man drenched in religious ideas and one who doesn't want to convert people to his basis, and he just want to have power over simple individuals. And I'm not saying such idea isn't worthy of view because it is, it feels real. The problem complicates because the writers and the director make a mess with this material, without appeal or anything interesting, one sequel replaces the other in a purposeless manner, it's all very detached, with no life to it.